I had a request from a lovely group of workmates who wanted a special gift for their co-workers’s new daughter. 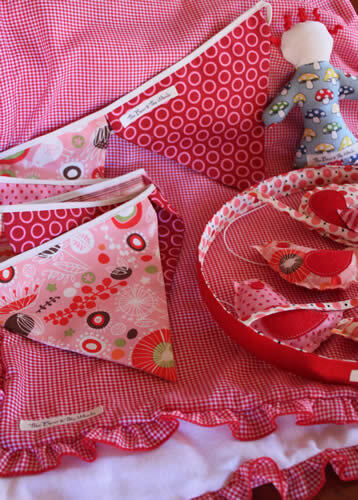 I made the red and pink birds mobile and a rattle and Mum made this beautiful lined gingham wrap with a frilled edge and a long 12-flag bunting to match the mobile. We enjoyed thinking about and creating this order so much and welcome any enquiries. I love the baby set! What a great gift idea! It’s a shame I cannot fit into those red pants…….! !